Now that is a bit better! Good news is that you can use it on any element, in any view, and with any tag…it basically is a Revit’s Tag All tool but with extra control over where the tag actually gets placed. Remember that 3D Views have to be locked to be able to place Annotation. Here’s a YouTube video with a brief demonstration. Any luck using this for placing room tags? I’m getting “NULL” when i try to use it for that. Thanks. This might sound like magic but Room Tags are not considered Annotation Tags per Revit API and actually have their own overload for placement/creation. newRoomTag = doc.Create.NewRoomTag(roomId, locationUV, viewId). Create Annotation Tag node will not work with Room Tags. Please try attached image instead. Good luck! Thanks for making all these tools! I am trying to use the “create annotation tag” on revision clouds, but am having trouble defining the location. The clouds themselves exist in views, not model space so I cant find a way to pull a location from them. Any thoughts? Sorry, I wasn’t clear. The clouds are already created, but I wanted to tag them with a revision triangle using the “create annotation tag” node. 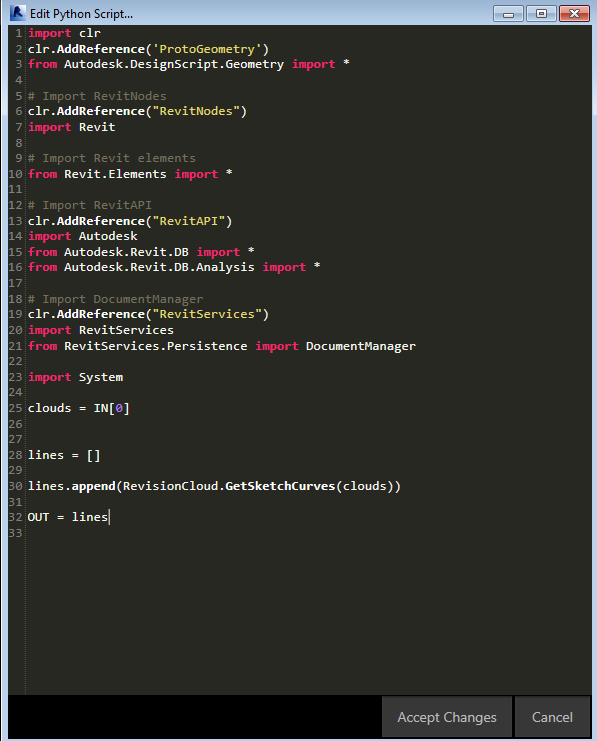 I will take a look at the revision cloud API methods, the IList variables seem like they could be used to find a location for the revision tag/triangle. Thanks for your help! Any help would be appreciated. Thanks you! 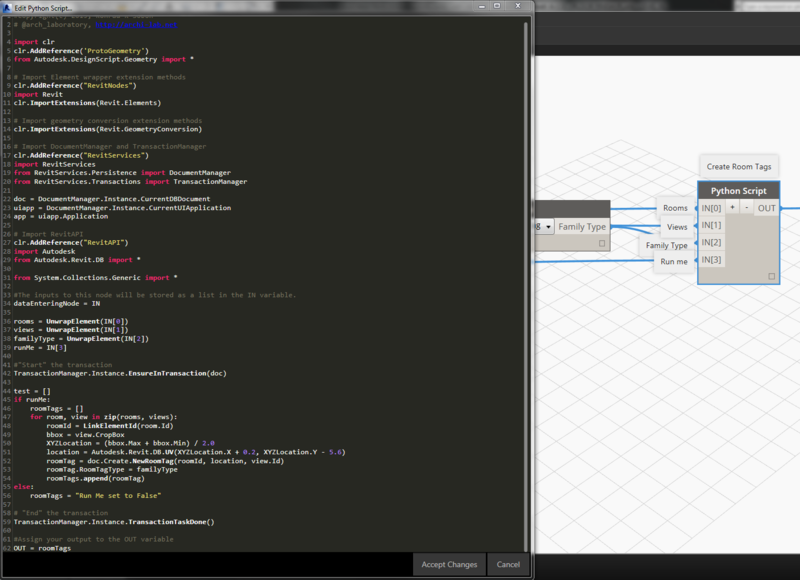 I had to “unwrap” the dynamo data :) my revision cloud sketch lines script works now. sorry for hijacking your comments section! I am glad you were able to answer your own question. I am sorry I wasn’t able to respond but I am currently traveling. Hi there, I’m a beginner in Dynamo. Was wondering is there any possibility that you might be able to share the dynamo coding here to me? Sorry, just follow the instructions. If you get lost post here or on the Dynamo forum and I am sure people will help you get it right. I believe that you will learn more the hard way, than the easy way. I found your Annotation Tag Package and would love to use it, however, Dynamo 1.2.1 doesn’t support it. ….. Never mind me, I was using the stand-alone Annotation Tag package instead of the Archi-lab package. All is well now. Any luck using this for placing Area tags? I’m getting “There is no loaded tag type that can be used when tagging referenceToTag with tagMode” when I try to use it for that. Thanks. Thanks sharing. I found the Create Annotation Tag. However, I am receiving an error that it cannot be opened in my version of Dynamo (1.3.3.0). Is there any way to update the package? You should be able to get any version of the package via Package Manager. 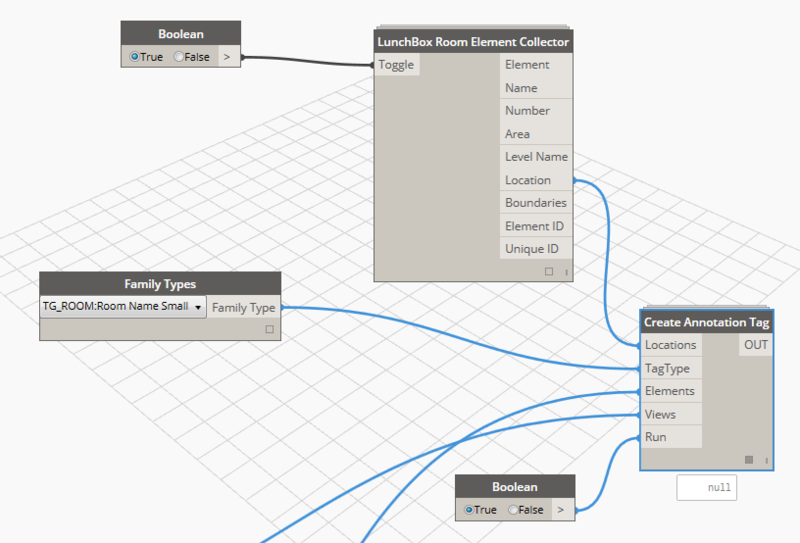 I have an issue I created this node to place tags on foundation as part of big Revit/Dynamo project. But for the life of me I can not get this to place correctly without running twice. I can help, but you gave me zero info about what the issue is. Please post some relevant information and I will try and answer. This may sound like a silly question but do you have a copy of the script somewhere in your posts? Hi, unfortunately not. I don’t post ready to go scripts, as I usually want people to follow the post, and re-create it. That way they can learn more. I know its not very efficient but that’s how I have been doing these posts for a while now. I might change that for the new ones.